Feeling Fictional: Owlcrate Unboxing - September 2017 "Mythical Creatures"
Owlcrate Unboxing - September 2017 "Mythical Creatures"
Owlcrate September Box "Mythical Creatures"
I finally got my first Owlcrate box and I absolutely loved it! Unfortunately I can't afford to get this every month because international postage is a killer but I couldn't resist the lure of Mythical Creatures and the potential for dragons LOL. Hopefully I'll be able to buy Owlcrate boxes occasionally in the future because I was really impressed with both the speed of shipping and all the items they included. I've waited until the Owlcrate photo challenge started to post this unboxing because I'm assuming that means everyone will have received their boxes by now but if you don't want spoilers of the contents then don't continue reading beyond this point! The first item in the box was this really cute dragon coin purse that was an exclusive item designed by the Owlcrate team. I'm definitely going to get a lot of use out of this! The second item was the gorgeous Mother of Dragons wooden bookmark from Ink and Wonder Designs, I absolutely love their woodmarks and this one is absolutely lovely. I'm a huge Game of Thrones fan so was very happy with this. The third item was Percy Jackson inspired bath salts from The Soap Librarian which have a lovely eucalyptus scent. Unfortunately I don't have a bath to use them in (my bathroom only has room for a shower!) but I think I'm going to try using these in my footspa instead. I'll admit that one of the big draws of the September Owlcrate box was that I knew there would be a Book Beau included in it. I was kind of hoping it might have a dragon pattern but I love this mermaid and unicorn design so I'm very happy with it. This is my first Book Beau and I think it's brilliant, it's nice and padded to will definitely protect whatever book I'm carrying in it and it's a great size too - plenty big enough for a large paperback or my kindle. The next item was this really cute Hagrid and Buckbeak sticker by Susanne Draws, I'm a huge Harry Potter fan so I love this. 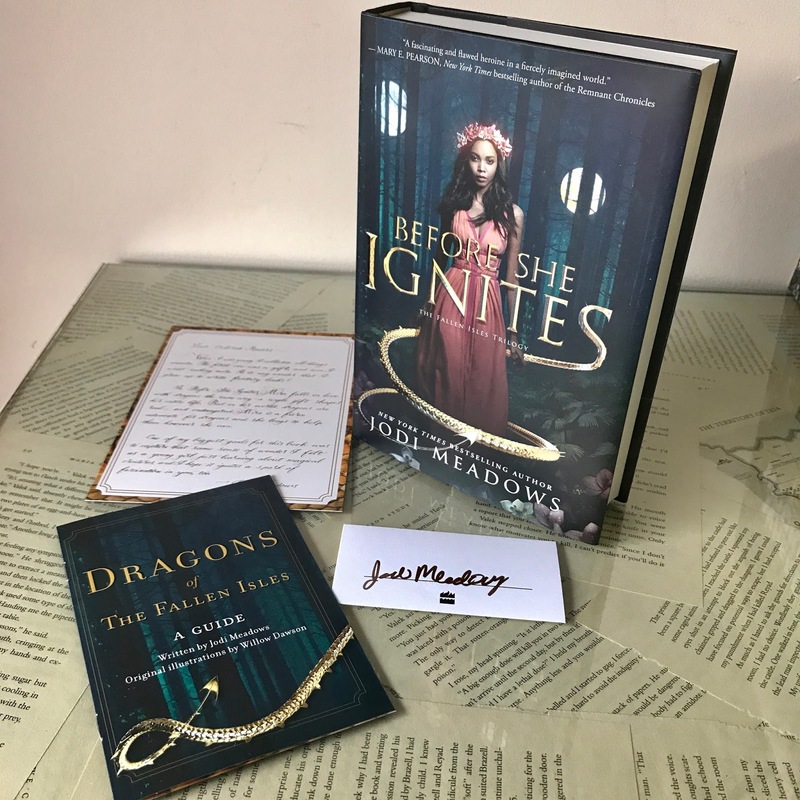 This month's book was Before She Ignites by Jodi Meadows which has dragons and sounds absolutely fabulous! I love that it comes with an exclusive edition cover too (in case you can't tell from the picture the writing is in gold not silver like the standard cover). Owlcrate also included a signed bookplate, a letter from the author, an interview and a mini booklet that's a guide to the different kinds of dragons in the book. I can't wait to read this one so you'll have to watch out for my review soon. I'll leave you with this final picture showing everything that was in the box. Like I already said I was really impressed with this box and I hope to order from Owlcrate again in the future. My favourite items were probably the Book Beau, the Woodmark and the cute little dragon purse but there wasn't anything I disliked and I'm impressed with the quality of everything included. Thanks Owlcrate, you did a great job with this one! The Princess Bride Turns 30! !